The difference between the 1992 and 2000 situations and today's is that a higher percentage of Americans say Trump's statements and actions over the past few days have made them "less confident" in his ability to serve as president than in those previous elections. Forty percent of Americans say they are "less confident" in Trump, as opposed to 28% for Bush in 2000 and 26% for Clinton in 1992. Fewer Americans say they have "no opinion" or say Trump's actions and statements make "no difference" than was the case for the two former presidents. Trump and Hillary Clinton voters differ significantly in their confidence in Trump's ability to serve as president since the election. While 95% of Trump voters say they are "more confident" in the president-elect, 19% of Clinton voters say the same. Only 2% of Trump voters say they are "less confident" in Trump, but 75% of Clinton voters express less confidence. After the contested 2000 election, which took five weeks and a Supreme Court decision to resolve, Americans were somewhat less polarized about their confidence in President-elect Bush than they are about Trump. In 2000, 85% of Bush voters were "more confident" in their candidate after the election's resolution, compared with 29% of Gore voters. In the 1992 three-way election, 23% of George H.W. Bush voters were "more confident" in Bill Clinton in the days after he was elected, while 84% of Clinton voters said the same. Ross Perot's voters were evenly divided, with 37% saying they were "more confident" in Clinton and 36% saying they were "less confident." Trump's campaign was embroiled in controversy over remarks he made about women and minorities. In the days after the election, 60% of men said they were "more confident" in Trump's ability to serve as president, while 42% of women held the same opinion. Similarly, 61% of whites expressed more confidence in Trump, compared with 27% of nonwhites. Trump's victory has triggered a wave of protests across the U.S., with calls to abolish the Electoral College and denunciations of the president-elect's policies. At the same time, many Trump supporters are excited to see their candidate take the country in a new direction. As it stands now, the overwhelming majority of Trump supporters remain confident in their candidate in the days after the election, while Trump has yet to win over Hillary Clinton's supporters. Overall, roughly the same percentage of Americans are "more confident" in Trump's ability to serve as president based on his recent statements and actions, as was the case with Bush and Bill Clinton after they were elected. Trump's similar results on this measure to Clinton's and Bush's are notable given Trump's much lower favorability rating, which may portend a low approval rating once Trump assumes the presidency two months from now. At the very least, the higher percentage of Americans who express less confidence in Trump than they did in Bush and Clinton at similar junctures likely suggests that Trump may be more polarizing overall. 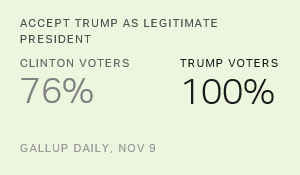 Results for this Gallup poll are based on telephone interviews conducted Nov. 9-13, 2016, with a random sample of 1,019 adults, aged 18 and older, living in all 50 U.S. states and the District of Columbia. For results based on the total sample of national adults, the margin of sampling error is ±4 percentage points at the 95% confidence level. All reported margins of sampling error include computed design effects for weighting. Less than half of Americans are excited or afraid after Tuesday's election, closely mirroring reactions to the 2012 election. The most common reaction? Surprise.